October 8th is a date KISS fans will have had marked on their calendars for some time as the release of the 20th studio album from the rock legends that are KISS. The release comes just months before the band's 40th anniversary. In the time that the band have been going they've managed 28 U.S. gold albums along with 40 million U.S. and 100 million in world sales - pretty staggering sales figures, and that's just albums - if you were to look at all the merchandise they've sold the figures would be astronomical. 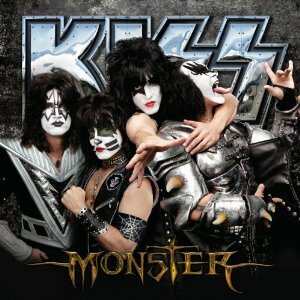 Monster is the first release since 2009's "Sonic Boom", and is only the second album from the current lineup of the band. The entire band have been involved in writing this album which was produced by Paul Stanley and Greg Collins. While lead vocal duties are primarily shared by Paul Stanley and Gene Simmons, the other two members also take a turn - Tommy Thayer does the lead vocals on "Outta this world" while Eric Singer takes over lead vocals for "All for the love of rock and roll". So, plenty of talk but will it live up to the hype? Sonic Boom was a good album, showing a return to form from the band, so is Monster up to that standard? Well, in my opinion, Monster is a far stronger album than Sonic Boom was. The album kicks off with "Hell Or Hallelujah", the first single from the album, so it's a song the KISS Army will have been listening to for the past three months. It's a damn good track - a strong chorus, crystal clear sound and a classic KISS feel to it. "Outta this world" is probably the most commercial track on the album, and I have to be honest, Tommy Thayer's voice just doesn't feel quite right on a KISS album - we're so used to Paul Stanley or Gene Simmons doing the vocals that another voice is going to take some getting used to. I suspect this track will grow on me as I get more used to his voice. "All for the love of rock and roll" is a track that I'm sure is going to sound great when it's played live - it's great on the album, but live I think it's going to quickly become a core aprt of their set. As you listen to the album it's definitely got more of a 70's KISS feel to it than Sonic Boom did, and it's really prominent in "Eat your heart out" - that guitar riff really does sound familiar. A fantastic album - KISS back to their best. Finally I have been waiting for such a long time for this Kiss album. This is def a buyer!